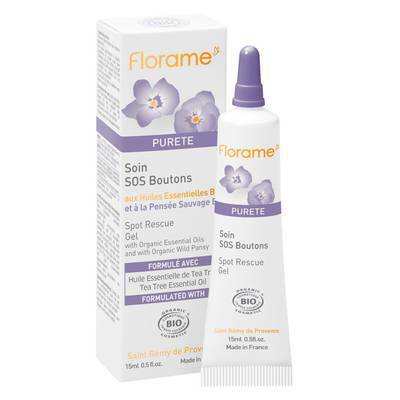 Le Soin SOS Boutons Florame favorise la réduction des imperfections. En application locale, il assainit votre peau grâce à son action ciblée. Pour une efficacité optimale, ce gel est notamment enrichi en huile essentielle biologique de Tea Tree, reconnue pour ses propriétés purifiantes. Votre peau est plus saine, plus belle. Ingredients : Aqua (Water), Alcohol**, Glycerin, Xanthan Gum, Aloe Barbadensis Leaf Juice Powder*, Viola Tricolor Extract*, Melaleuca Alternifolia (Tea Tree) Leaf Oil*, Hydrolyzed Algin, Lavandula Angustifolia (Lavender) Oil*, Lavandula Hybrida Oil*, Abies Sibirica Oil*, Litsea Cubeba Fruit Oil*, Citrus Medica Limonum (Lemon) Peel Oil*, Zinc Sulfate, Saccharide Isomerate, Phenethyl Alcohol, Rosmarinus Officinalis (Rosemary) Leaf Oil*, Citrus Aurantium Amara (Bitter Orange) Leaf/Twig Oil*, Pelargonium Graveolens Flower Oil*, Salvia Sclarea (Clary) Oil*, Thymus Vulgaris (Thyme) Flower/Leaf Oil*, Mentha Viridis (Spearmint) Leaf Oil*, Zingiber Officinale (Ginger) Root Oil*, Parfum (Fragrance), Sodium Benzoate, Potassium Sorbate, Citric Acid, Sodium Hydroxide, Linalool, Limonene, Citral, Geraniol, Citronellol.